Today’s poems (for there are five as part of a set) are by Anna Robinson from her collection, The Finders of London. 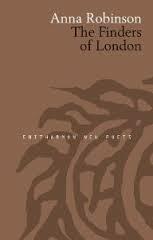 I would say that Anna herself is a finder of London as she uses poetry to show a history of the capital from a different perspective, following a tradition that goes back to Henry Mayhew’s classic ‘London Labour and the London Poor‘. She does this so well in these prose poems, which strip away the sensationalism and misogyny so inherent in portrayals of the Whitechapel/Ripper murders, leaving us with a rich description of these women’s lives in the year 1888. These are women who may be full of contradictions (She does not drink except for rum) have fallen foul of the law (She has been arrested for impersonating a fire engine down Aldgate) and are controlled by men, but they find ways round (She keeps a key in her petticoat pocket. It is for the padlock the waterman uses to try to make her stay). The shadow of these women’s fate makes these poems tragic but they are also funny and uplifting, and give us a picture of London’s Victorian poor from a new angle. Anna recently published her collection, Into the Woods (Enitharmon Press) and I am also interested in her first pamphlet, Songs from the Flats, which I have yet to read. She is currently doing a Phd, ‘exploring shared concerns between poetry writing and history and asking if poetry is a suitable vehicle for micro-history’. I would be interested in peoples’ views on this. The locksmith’s daughter has a heart shaped face. Her chestnut hair is pinned back in the style we all wear. Her fringe is two curls, which fall half way down her forehead. Her eyebrows are comet-shaped. Her lips are full but not wide and she likes a gin. Her eyes are grey. She keeps things neat, and tonight she has a new black bonnet made of straw and trimmed with velvet. The docks are on fire; the flames have turned the sky red. We can see this from the pub. Her nose is small. Her feet are small. She doesn’t mind the shadows thrown from Buck’s Row. She’ll find her doss. She’ll be back in a minute. Keep the bed warm. Her movements are, eventually, always easterly. Steady, sturdy, she walks, always circling that idea, with a good wide stride. Her face is round. Her eyes are blue. Her dark brown hair is curly. It holds pins tolerably. Her fringe is thick and long. Her lips are full. She is pale. She is dying and will do what she wants. Crochet, she loves to crochet – but where is the hook? She does not drink except for rum. She moves with the ghost of a young girl beside her. Her son is a cripple. Her daughter has run away to the circus. The fences along Hanbury Street are five feet tall. She is five feet tall. See that Tim keeps the bed for me. Twenty-nine is her favourite number. She always sleeps at number twenty-nine. Tall, this one, and Swedish. She says her husband and children were killed in a steamboat crash, but that is a lie. Now, she is living with a waterman. Her jacket is fur trimmed. She has been eight times before the magistrate in twenty months. Her ears are elves ears. Her eyes grey. Her long face ends in a neat bulbish chin. Her mouth is wide and held in a smile and her dark hair flicks in outward curls. She does not understand The Bible. We call her Long Liz. She has her doss. She earned it cleaning. She keeps a key in her petticoat pocket. It is for the padlock the waterman uses to try to make her stay. The tinplate worker’s daughter has come south, from Wolverhampton. She has had her share of husbands, the gallows balladeer (whose initials she has tattooed on her arm) and the lampblack packer, and now she is with a fruit seller who has a dodgy cough. They sleep at Cooney’s lodgings and spend the summers hop picking. She is short and slim with brown eyes and dark red hair. She has been arrested for impersonating a fire engine down Aldgate. We all saw it happen. The fruit seller loves her; they have never had a row despite her famous temper. She is an educated woman. She wears no fringe, her eyebrows are owlish. She has gone to find her daughter who has flown since last time and left no forwarding address. She is Irish, this girl, but speaks fast, in Welsh. Big handed and tall, she has thick blonde hair, with a fringe that flops long on one side. Her eyes are blue. Her man is a porter at Billingsgate, or was. She has been loved by many men and I am telling the truth: really loved. Even by some who paid good money. I am truthful, as she is always, and that can be hard. Her song is ‘A Violet from Mother’s Grave’. The flower seller hates it and cannot sleep. She has a way of standing on the street, as if she were on a stage. Miller’s Court is her haven and where a girl in trouble can find her. ‘The fisherman’s widow’ adorns her fireplace wall. Her apron is always spotlessly clean.